All the jobs are done and I had a bit of me time today so as well as doing a layout which I'll share later in the week, I also got around to making the OHs Valentine card. 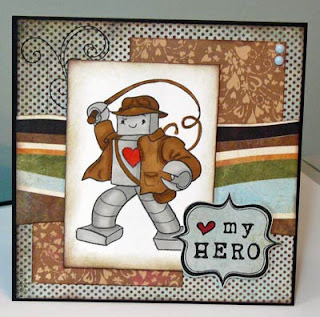 I used the sketch on Basic Grey Challenges (the papers are BG Archaic and Bittersweet) and it also counts for the Our Creative Corner challenge which is 'masculine valentine'. It's not a very traditional Valentine but I think he'll like it. The stamp is by Bam Pop - nuts but I just love it!!! I like this - unusual but fun. Great colouring too. Ohhh, great job on the masculine valentine challenge. I love all the colors and patterns of the DP you used - very manly. And that image is very cute. So happy you could join in the fun at Our Creative Corner this week. Adorable card. Love the colours.